Outspoken New Patriotic Party (NPP) National Communications team member, Kwame Baffoe, popularly known as Abronye DC has accused former President John Mahama of renting an apartment in Germany for former HIV/AIDS Ambassador, Joyce Dzidzor Mensah. This, Abronye alleges, is a skewed attempt to help Joyce Mensah resist arrest in Ghana. It would be recalled that Abronye DC petitioned the CID to arrest Joyce Mensah for making a false declaration when she misrepresented herself as being an HIV patient so as to fall within the ambit, scope, and retirement of the Ghana Aids Commission. According to him, Joyce Dzidzor Mensah subsequently succeeded in deceiving the Ghana AIDs Commission and in August 2011, she signed a contract with the commission as an AIDs Ambassador. However, the contract was later terminated by the commission in November 2012 on the grounds of breach of her terms of the contract. He opines that the former AID’s ambassador after having her contract with the commission terminated, she continued to enjoy a lot of incentives as if she was still in contract with the commission. It was as a result of this that he petitioned the CID to arrest her. Speaking on Accra-based Net 2 TV on Wednesday, March 27, 2019, the NPP's Communicator, Abronye DC alleged that Joyce Mensah fears if she stays in Ghana, the police will arrest her so the former President John Dramani Mahama has rented an apartment for her in Germany to stay there. He added that former President Mahama rented the said apartment for her because if the police in Ghana arrest her, his wife will be exposed. "Immediately after my petition, John Mahama rented an apartment for Joyce Dzidzor in Germany so as to avoid her arrest. John Mahama did that because, if Joyce Dzidzor is arrested, his wife Lordina Mahama will be in trouble and exposed for her bad deeds", he added. 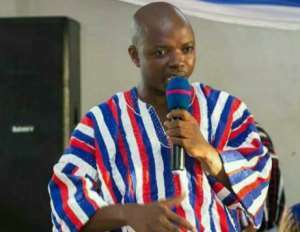 Abronye DC has indicated that he is going to petition the Ghana Police Service to work with Interpol to arrest the former Ghana HIV Ambassador for prosecution. Meanwhile, Joyce Dzidzor Mensah last month posted on her Facebook page that nobody can touch her because she is too powerful in the country. "Bronya or Christmas DC or whatever they call you. How is market? You wrote to the CID to arrest me for spending the Nation's supposed $3 million. I'm still waiting for my arrest. 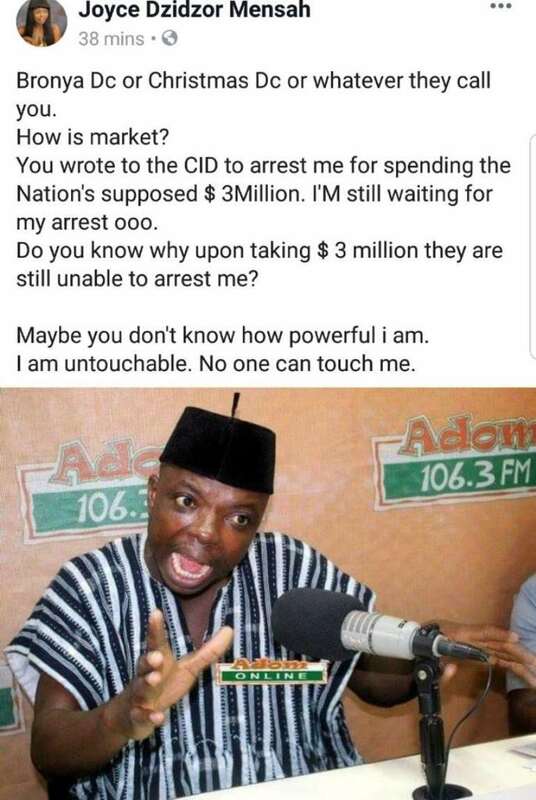 Do you know why upon taking $3m they are still unable to arrest me? Maybe you don't know how powerful I'm. I am untouchable. No one can touch me".